In early 1977, Gordon Wade Rule (Rule) sat in a chair in a corner of a conference room at the Naval Material Command reading a document that I had prepared about his negotiations on the CGN-41, a nuclear-powered guided missile cruiser. Days earlier, I was among a group that was briefed by a staff member of Admiral Hyman Rickover (Rickover), the Director of the Naval Nuclear Propulsion Program. Although, the briefing was supposed to be about the CGN-41 negotiation, we were treated to a 3-hour lecture on how the Navy's shipbuilders were trying to "pin the rose" on Rickover. In this case, pinning the rose had nothing to do with the shipbuilders asking the Admiral to a prom. When I began writing this blog entry, I had planned to include only the work I had done decades ago for the Chairman, House Committee on Armed Services. That work involved Rule's negotiation of Modification 31 to the contract that included the CGN-41, the eventual USS Arkansas. I wanted you to figure out if the modification that Rule signed was done in a manner that would allow it to survive a court test. It took 2 courts to decide that question so it wasn't as easy as it sounded. Unfortunately I read too much surrounding material and I realized that I was taking Rule's actions out of the context in which they happened back in the 1970s. So, I added a bit more information. You will see Rule as the contracting officer, Rickover as a program officer interfering with the contracting officer, Senator William Proxmire apparently acting for Rickover and himself, and Deputy Secretary of Defense William P. Clements, Jr. (Clements) trying to resolve the shipbuilding claims problem in any manner he could. You cannot choose sides on this one. All characters, including government agencies and shipbuilders, were trying to manipulate and influence anyone that became involved with the CGN-41. It seemed as if sides were drawn by identifying the enemy of an individual's enemy. In the early 1970s, cost overruns and shipbuilders' claims had become a major problem. By 1976, it had reached epidemic proportions with $1.9 billion in shipbuilder claims. The shipbuilders, the Navy, the Department of Justice, and Rickover were in a war. In the case of the CGN-41, Newport News Shipbuilding and Drydock Company was the industry player. On Apr. 30 Clements informed both the Senate and the House Armed Services Committees of his unusual plan to clear up long-pending claims, which he said are largely responsible for the "acrimonious and adversarial environment that now marks Navy-shipbuilders business relations." He promised the legislators a progress report on June 10. At the same time, he predicted privately that he would have the claims situation wrapped up by that date. The settlements would be under terms of Public Law 85-804, enacted by Congress in the early 1960s to enable the Defense Dept. to modify contracts when it is in the interest of national defense. The law was amended in 1973 to require that Congress be notified prior to use of the law for any modification exceeding $25 million and be given 60 days to disapprove. Clements intended to use this program to bypass traditional, drawn-out appeals board procedures and to wipe the slate clean of the massive extra dollar amounts demanded by shipbuilders to compensate them for such things as Navy-ordered design changes, late delivery of government-furnished equipment, and higher-than-anticipated inflation rates. But at midweek Clements was far short of his goal. The two shipyards with the bulk of the outstanding claims were reluctant to accept his offer of roughly 40¢ on the dollar in immediate cash. A lot of money. Tenneco Inc.'s Newport News Shipbuilding & Dry Dock Co. filed the largest of the outstanding claims-some $894 million. After meeting Wednesday morning with Clements, Newport News President John P. Diesel said: "We have failed. We can't get together on money, and the Navy has not done a damn thing about changing contracting procedures." After failing to reach a settlement himself, Clements called Navy management to his office for a meeting of the status of shipbuilding claims. Nothing had been accomplished by them either. He then focused on the CGN-41. The work on this ship had been stopped by Newport News because of issues it was having with the Navy. The contract was in court and work had started again under the condition that the Navy negotiated in good faith with Newport News to resolve the issues. The court's time limit for good faith negotiations was running out and something had to be done. Since the CGN-41 contract was in court, the Department of Justice was required to play a part in the review of any settlement proposed to the court. This is where our story begins. I have added the dates on which the actions occurred so that you can follow. All facts are based on documents that I had reviewed in the 1970s or documents that I recently reviewed. I needed to limit the length of this entry so I added enough information to give you a flavor of the times. Sometime in the future, I may write a larger article. Rule was appointed as a special contracting officer on the CGN-41 to resolve the issues that the Navy and the Secretary of Defense could not accomplish. Undoubtedly he knew he was heading into a mighty storm that might harm him. During the meeting it was agreed that Rule would become negotiator for the CGN-41. He was to report directly to the Chief, NAVMAT and the Vice Chief, NAVMAT was to meet with Clements each day at 9:15 a.m to report on the progress of the negotiation. July 14, 1976: Rule telephoned Newport News to explain that he had been assigned principal negotiator on the CGN-41 and requested a meeting. July 15, 1976: Newport News was contacted by a consultant to Clements who explained Rule's authority. Rule and Newport News held their first meeting. July 16, 1976: The Assistant Secretary of the Navy (Installations and Logistics) wrote to the Chief, NAVMAT informing him that the Chief would be responsible for the direct discussions between Rule and Newport News. Rule would be the principal negotiator and Rule would be assisted by NAVSEA and the Navy General Counsel, as required. July 16, 1976: Rule sent a memo to Clements describing his first meeting with Newport News. As a note, he mentioned that he intentionally did not contact the Navy's Supervisor of Shipbuiliding, Conversion and Repair (SUPSHIPS), Newport News. July 19, 1976: Rule sent a memo to the Deputy Commander for Contracts, NAVSEA asking for brief descriptions of what the Navy considered as key issues for negotiation and the Navy's negotiating position so he could develop his own negotiation position. July 28, 1976: The Vice Chief, NAVMAT and a consultant to Clements held discussions with Newport News. Areas discussed were: when the CGN 41 problems would be solved, ceiling price, and escalation provisions. August 10, 1976: Rule telephoned Newport News and requested a meeting in Washington on August 12,1976. August 12, 1976: During a meeting in Washington between Rule and Newport News, Newport News left a general outline for negotiations. August 12 and 13, 1976: The Vice Chief, NAVMAT asked Rule about the August 12 meeting so he could inform Clements. Rule explained that Newport News had delivered a proposal and he did not approve of it. August 17, 1976: Rule telephoned Newport News and requested a negotiating session to be held on August 20, 1976. August 19, 1976: The Deputy Chief of Naval Material (Procurement and Production) issued Rule an appointment as Contracting Officer with "unlimited authority with respect to negotiations with Newport News." August 20, 1976: Negotiations were held between Rule and Newport News. At this meeting, the Chief, NAVMAT ordered Rule to describe the results of the August 20 negotiations. settlement be referred formally to the Naval Sea Systems Command for review and comment by knowledgeable personnel directly responsible for the work in question. In this regard I [Rickover] will be glad to provide assistance based on my own knowledge of the events in question. I understand that the Department of Justice has sole responsibility within the Government for approving out-of-court settlements involving Government matters under litigation. I assume that the Justice Department will review any such settlements proposed by the Navy in the CGN-41 case. However. in view of the importance of the CGN-41 case to the overall shipbuilding claims problem, I request that you direct the Navy to keep you fully informed of any negotiations and that you review any settlement offer to ensure that it is on sound legal ground and in the public interest before the Government becomes a party to it. From your many, years in government service I know you realize that business sensitive negotiations should not be influenced by sources outside of the designated negotiating parties, and that a broadly distributed letter from you, such as reference (a) [August 24, 1976 memo from Rickover described above], cannot help but cause perturbation in the negotiating process, disrupting the efforts of the assigned negotiator. The Chief, NAVMAT further wrote: For reasons such as this, you must stand apart from these negotiations unless the technical areas regarding naval nuclear reactors become involved. I felt obliged to inform them of what I had heard. I am sure you are not implying that it is improper for me to call such matters to the attention of those responsible, and point out potential problems. To remain silent would be analogous to not warning my mother that she was about to fall off a cliff. He used the same distribution list for this 6-page letter as he did in his August 24, 1976 letter. August 30, 1976: Newport News met with Rule in Washington and delivered the first draft of Modification P00031. The Chief, NAVMAT sent a letter to Rule explaining that, prior to a binding agreement on the CGN-41, the elements of the agreement must be submitted to the Chief, NAVMAT for review and approval. The review was to be conducted by the Vice Chief, NAVMAT, the Deputy Chief, NAVMAT (Procurement and Production), the NAVSEA Deputy Commander for Contracts; and the General Counsel for the Navy. Mr. Rule was to provide the proposed contract modification, the business clearance justifications, and other supporting papers for review prior to signature by the contracting officer. Gordon Rule forwarded a draft memorandum to the Chief, Naval Material that summarized his negotiations with Newport News. 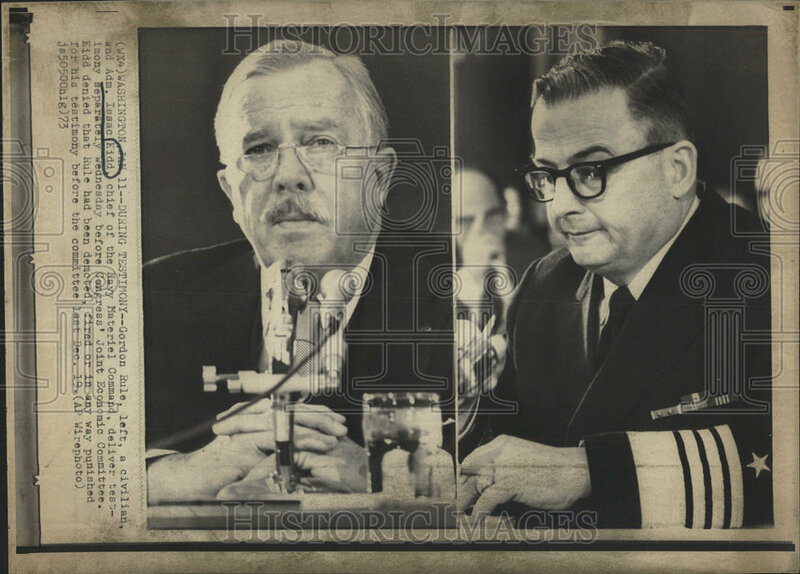 August 31, 1976: The General Counsel of the Navy noted the Rule draft memorandum and told Rule of the General Counsel's responsibility to review the summary of negotiations. Additionally, the General Counsel requested more information to support Rules' summary. September 1, 1976: Rule sent a summary of his negotiations to the Chief, NAVMAT. September 3 1976: In response to the August 31, 1976 memo from the Navy General Counsel, Rule sent him additional information supporting his summary of negotiations. He also provided a copy of the first draft of Modification P00031. September 14, 1976: Members of Rule's and Newport News negotiating teams and DCAA auditors met in Washington to discuss provisions in the first draft of Modification P00031. DCAA was asked to review certain provisions of the proposed modification. Your letter requests that I direct the Navy to keep me fully informed of any negotiations and that I review any settlement offer to insure that it is on sound legal ground and in the public interest. The Justice Department intends to review any proposal and/or papers before submission to the court. We would request the court to approve any settlement only if we are satisfied that it is on sound legal ground and in the public interest. September 20, 1976: NAVSEA's Deputy Commander for Contracts and a member of the "review team" submitted his analysis of the first draft to the Vice Chief, NAVMAT. This analysis was not made available to Rule. September 24, 1976: DCAA submitted its analysis of certain provisions of the first draft to a member of Rule's negotiating team. September 27, 1976: Newport News delivered a second draft of the modification to Rule and Rule requested DCAA to review the draft. Senator Proxmire in his letter suggests that Mr. Gordon Rule is not impartial and that he might not act in the Government's interest but would so act as to undermine the Government's ability to enforce contracts. This is a serious charge by the Senator and defames both the character and competence of Mr. Rule. As I have indicated, it was at my suggestion that Mr. Rule was appointed by the Navy as the senior negotiator in the CGN-41 matter. I know Mr. Rule's background and work experience during his years as a Navy procurement official, and I am familiar with his current work as the CGN-41 negotiator. I consider Senator Proxmire's remarks regarding Mr. Rule ground-less, ill-tempered and unworthy of a member of the U.S. Senate. In regard to the Department of Justice's review of the CGN-41 negotiation, he said: "Let me assure you that we in DoD have no intention to by-pass or withhold from your department any information which you determine that your department needs in connection with legal proceedings under the court order." September 28, 1976: DCAA submitted its analysis of the second draft to Rule. October 4, 1976: NAVSEA submitted its estimate of the cost of the draft modification. Rule rejected the NAVSEA estimate. October 5, 1976: Rule submitted a memorandum to the Chief, NAVMAT for his approval. It included the estimated dollar impact of his negotiated settlement. For those in contracting, it would be similar to a negotiator's memorandum. The Navy General Counsel sent its analysis of the information supplied by Rule to the Attorney General. In the memorandum, Rule noted that a member of his negotiating team could not complete an analysis he requested because of interference from Rickover and his staff. However, he was able to devise a workaround to complete his cost estimate of the modification for the Chief's review and approval. October 7, 1976: Newport News carried a third draft of the proposed modification to Rule. The cover letter from Newport News attached to the modification said "I have executed the enclosed modification on behalf of the company and request you immediately return a fully executed copy." Rule took a copy of the cover letter to the Chief and Vice Chief, NAVMAT in the afternoon. He returned to his office and received a letter from the Chief, NAVMAT telling him that neither he nor his review group had a copy of the proposed modification that accurately reflected the results of Rule's efforts. Final review had not been completed and the proposed modification could not be consummated before the review was done. could see what was happening to this whole negotiated settlement. I knew the object of the negotiation. I knew why I had been picked to negotiate a settlement pursuant to the order of the court, which I had done. I could see the Rickover-Proxmire, et al., influence at work everywhere. And I decided those things all-those things all ran through my mind-I wasn't unmindful of the roadblocks and the lack of cooperation that I had gotten and was getting from the office of General Counsel. When my Contracting Officers statement was turned over to the Office of General Counsel for their review, they then asked me for substantiating documents. I gave them those documents . . . . They were requested by Admiral Lascara [Vice Chief, NAVMAT] to please not write anything until we can get together and discuss this: Let's at least discuss it. Rule had said one thing. Now, review it and let's get together and discuss it before you write anything. They never did. They wrote a 85-page document. They had lawyers working their butts off. They wrote an 85-page document and turned it over to the Department of Justice. And I don't know what it says today. They won't tell me. These are my own lawyers that are supposed to be helping me. They've never told me what was in there. Well, on the 7th of October when these things ran across my face, before my eyes, I said: Something's got to be done. I'm a Contracting Officer. I've got the authority. Now-I'm going to sign the goddam thing. And I signed it. October 8, 1976: The Vice Chief, NAVMAT called Rule into his office at 8:22 a. m. He gave Rule a letter dated October 7, 1976 that explained that he did not have authority to sign the modification. Rule explained he had signed it and the Vice Chief requested Rule to give him all signed copies. Rule refused but said he would give them to Clements. The Vice Chief then left for his 9:15 am meeting with Clements. Rule returned to his office dictated a transmittal letter imposing two conditions upon the modification and gave Newport News a copy. The Vice Chief, NAVMAT called Rule into his office and told him that the Undersecretary of the Navy would keep all executed copies of the modification but Rule told him that he already had signed it. He returned to his office, signed the transmittal sheet, and handed it to Newport News at 10 A. M. Shortly afterward at 11:50 a. m., Rule was notified that his appointment as contracting officer was rescinded. There was a meeting of the minds of the parties on August 20, 1976; there is adequate consideration to support this compromise agreement; and failure to provide cost of pricing data does not invalidate the agreement. We find that Deputy Secretary of Defense Clements, who initiated the negotiation efforts, has approved the compromise agreement. We vacate this order [District Court's above] because we conclude that the parties' negotiators did not settle the case orally and because the Attorney General, whose approval was essential, rejected the terms that were ultimately reduced to writing. Great write up Bob. While certainly not at the level described above, as a Contracting Officer, I am sure that many of us have had to work with undue influence at many levels on many procurements. I know I have. It there is only one thing to be admired in the above, and there are many, it is that Mr. Rule certainly lived up to his name - he followed the rules, refused to be unduly influenced and reached an agreement on a very politically charged and contentious modification. It is an extremely hard thing to do, but it is an essential part of being a Contracting Officer. There was a modification 18 to that contract that set a new pricing arrangement for the CGN-41 part of the FPIF contract. The amounts theoretically could have been negotiated lower in Rule's modification 31 but that was not realistic. Rule accepted the amounts in modification 18 because the Navy expected Newport News to hit the ceiling price. So, the Navy didn't expect to reach target cost, it expected to hit ceiling price. Rule negotiated increases in escalation, energy growth, and fringe benefits. If the amounts were reached, it would have increased those costs by about $40 million. The CGN-41 was one of the Virginia class of nuclear cruisers--it was preceded by CGNs 38, 39, and 40. The CGN-42, to be built after the CGN-41 was never built. The overall contract was awarded in 1970 for the 38, 39, and 40. The 41 and 42 were options. This was the energy crisis era and I seem to remember a period of increasing inflation. There was about $800 million in claims against the 38, 39, and 40 in addition to some nuclear carriers and subs. The Navy and Newport News settled for about $200 million. FBI investigations continued into the 1980s on claims submitted by Newport News. In 1984, a congressional hearing was held, and by that time, Justice had not taken Newport News to court. The Justice Department did not think they had a winnable case and part of its concern was that Newport News would use Rickover as part of their defense. Another concern was the statute of limitations. Sadly, the CGN 41, the USS Arkansas, was scrapped after 18 years because the refueling of the nuclear reactors was deemed to be too expensive. The entire Virginia class suffered the same fate. In addition to the refueling costs, they became victims of the peace dividend. There was other armament concerns also. Several years after sitting with Rule in that conference room, I met a fellow that had worked for Newport News but at that time he was working with us. He gave me a plastic mug with a picture of the CGN-41 on it. I still have it. Love this. Thanks for taking the time to write it up. I've always been on the contractors' side of things and I appreciate getting another viewpoint. From the contractors' side, we work diligently to avoid litigation, which is costly and takes a very long time to resolve issues. On the other hand, I sometimes think the COs welcome litigation because it takes the burden of making a difficult decision off their shoulders. It's very interesting to me that Rule was willing to make the tough decisions; his obvious courage is admirable. Gordon Rule was the spiritual ancestor of every smart, tough contracting officer who followed him, whether the contracting officer ever heard of him or not. Rule was the subject of a lengthy story by Brit Hume that appeared in The New York Times on March 25, 1973, "Admiral Kidd Versus Mister Rule." You can search for it at The Time's website. He was also the subject of several other articles in The Times. WASHINGTON—The moral climate in our great country, and our great Navy, is so eroded today that we are headed for national disaster. There is one basic philosophy and one basic reason that have brought about this moral climate. The basic philosophy was accurately described by Gen. Douglas MacArthur when he said that what was wrong in our country was that people were trying to see how little work they could do for how much money they could get. The basic reason is the amount of money available today for defense procurement. The very size of today's defense budget is corrosive and corruptive, in the absence of wage and. price controls—and don't forget for one second that the only people directly responsible for the prudent spending of those defense dollars are people in procurement. Every other category of individuals in the weapons‐system‐acquisition arena, with the possible exception of the lawyers, has other piimary objectives than prudent contracting. James R. Schlesinger as Secretary of Defense recently, lamented cuts in the defense budget. I wonder why he wouldn't face up to what was happening to the taxpayers' defense dollar because of the direct inflationary effect on the defense budget of no wage and price controls, which results in so many more dollars being required. Our taxpayers' defense dollars are being ripped off shamefully, and until or‐unless we reimpose wage and price controls—at least on the defense sector—this country will continue to head downhill to disaster or to another form of government. Multimillion‐dollar defense contracts have become multibillion‐dollar contracts, and corporate, political and individual morality has reached the choke point with all these billions of the taxpayers' money being up for grabs. Just look around and see the conflicts of interest, officers leaving the Navy for jobs with defense contractors, or officers retiring and being rehired, as civilians or obtaining contracts with the Navy. Another indication: defense contractors who admit to bribes—or, kickbacks—when attempting to obtain contracts from foreign countries; and entertainment of officers—mostly flag —in this country. Does anyone believe that defense contractors who have admitted to illegal campaign contributions in the United States, and bribes, kickbacks, etc. abroad, have a double standard of corporate morality that precludes improper and illegal practices in this country when trying to obtain defense contracts? In short, does anyone believe that they have one corporate policy in the United States and another that takes effect the minute they leave our shores? I don't believe it. I am sorry to say that I do not believe our Department of Defense will take affirmative, punitive action against these defense contractors and the admirals or generals who appear to have violated the clear intent and meaning of the department's conflictof‐interest regulations. Letters of admonition or censure forpoor judgment put in their files after they retire are silly, in my opinion. I have long contended that defense procurement would be sanitized by permitting defense contractors to go into bankruptcy if they failed to meet their contractual commitments and obligations. The D, Tense Department would obtain our contracted‐for procurements if a company went into bankruptcy and such action could result in needed management changes. We all know, however, that the Lockheeds, Grummans and Northrops are sacred cows for the politicians and the defense hierarchy with the result that corporate morality is all but forgotten. These corporations who do business with the Defense Department on their terms are not even subjected to enlightened trade‐association disciplines in their industry. Even voluntary codes of ethics and fair‐trade practices are either nonexistent or nonenforced, and collectively they laugh at efforts to require them to be truly accountable for their spending of the taxpayers' defense dollars. Similarly, I have long contended that it one admiral or general—or any other officer—was court‐martialed and dismissed for conflict‐of‐interest violations, the entire procurement operation, as well as Navy credibility, would be immediately enhanced. Bold positive, disciplinary action is required by our leaders. But don't hold your breath until you see such action. Now think about the "Fat Leonard" scandal. I worked for NAVSEA at that time and am somewhat familiar with this incident. What Rule did was wrong on many levels because he simply did not have the authority to bind the government in the manner that he attempted to do. Under NAVY Directives, the modification needed to be approved by the General Counsel before it could be executed. It never received such approval. Similarly, by law, once a matter goes into litigation, a contracting officer loses the authority to resolve the matter. Instead, the Department of Justice has the sole authority to do so. There were other issues with what Rule did regarding the modification. As I recall, shortly after this incident occurred, Rule retired when he was in his 70's. Interesting. What was your job at NAVSEA? When you say "somewhat familiar," were you personally involved in the matter? Is your knowledge based on access to participants and documents, or scuttlebutt and press reports? Are you saying that Rule was forced to retire? Under NAVY Directives, the modification needed to be approved by the General Counsel before it could be executed. It never received such approval. Interesting. Are you saying that a SECDEF appointment as principal negotiator, with Legal supporting, was superseded by Navy Directives? I find that difficult to accept. Vern and H2H, I worked in the Strategic Systems Project Office (SSP-1), a subordinate organization to NAVSEA, also located at Crystal City at that time. My familiarity with this incident was derived from periodic staff meetings in which individuals who were directly involved with the shipbuilding claims resolution process participated and reported on the progress of the claims resolution, including what Rule was doing. As I recall, Rule had a warrant issued by the NAVY. He did not get a separate warrant from DoD. As a NAVY contracting officer resolving a dispute concerning a NAVY contract, he was obligated to comply with NAVY contracting requirements, including various required reviews of proposed actions, including review and approval by NAVY general counsel attorneys. My memory is that as a result of his actions in regard to the CGN-41 claim, his warrant was revoked. He retired shortly thereafter. Shortly afterward at 11:50 a. m., Rule was notified that his appointment as contracting officer was rescinded. The Vice Chief, NAVMAT called Rule into his office at 8:22 a. m. He gave Rule a letter dated October 7, 1976 that explained that he did not have authority to sign the modification. Rule was a distinguished attorney and he knew that he was negotiating to satisfy a court order. He knew that meant his negotiation had to be approved by the U. S. Department of Justice. Why did he sign that modification is known only by him but he explains it in his sworn deposition, an excerpt of which explains his thinking, and which I have included above. Going back to the original signing of the contract on June 25, 1970 for the Virginia class DLGN's which became CGNs, I remember reading a memo from Secretary of Defense Melvin Laird to the Navy that they could only buy 3 ships--not 5. To get around that, the Navy had the first 3 ships as a base and options to buy two more ships, one of which was the CGN 41. I have always been suspicious about the pricing of the ships but I did not have the time nor the authorization to resolve my suspicions. I cannot let Rule off the hook for that contract awarded in 1970 because he was in NAVMAT's Procurement Control and Clearance Division at that time. I assume he was its Director and his office had to approve the original award which it must have done. On December 21, 1971, mod. 7 was added which authorized construction of the first 3 ships and set the FPIF pricing arrangement for the CGN 41 option. It had an 80/20 share ratio. On February 1, 1973, mod 18 was awarded to extend the date to exercise the option for the CGN-41 by 2 years. That mod. increased the pricing structure to the one that Rule agreed to in his 1976 negotiation. Additionally, the share ratio was now 95/5 and 90/10. That gives you an idea of expected final pricing for the CGN-41 even though it was stated that final pricing somewhere in the future was subject to downward revision. It was a bogus structure in 1973, if not 1970. Mod 18 also left the final resolution for escalation and several other things somewhere down the road. By the time Rule was handed the negotiation of mod 31 by Clements in 1976, the Navy and Rule were negotiating, not at target cost, but at ceiling price. Remember, that at the same time there were claims on the CGN-38, 39, and 40 which were eventually negotiated for roughly 20 cents on the claimed dollar. The escaIation provision left open by mod. 18 was finally agreed upon--3 years later. I would not have approved Rule's negotiation myself because of the bogus pricing structure but that was the state of Navy shipbuilding back then. You can get a flavor of the times by carefully reading the original entry. Rickover was forced to retire in January 1982. Rule lived a building or two away from NAVMAT in the Crystal Plaza complex and died in August 1982. Proxmire had hair plants placed in his head (was still bald) and continued to run down Mass. Ave to work. Once in a while, I acknowledged him. Shipbuilding claims continued. Found this post to be extremely interesting, and found the picture when searching the internet for more information on Mr. Rule. He was dressed in a dark, vested suit, with his watch chain strung perfectly from one side of the vest, around a button, to the other side of the vest. Years after I wrote that, I was fortunate enough to speak with his son who was also an attorney. His son told me that he keeps his Father's watch chain and watch, which I describe above, on his desk where he works. Needless to say, that phone conversation with his son was a high point for me.